It has long been known that something special lay in the dunes at Bostadh, as every now and then an artefact would be discovered on the beach. In the Spring of 1993, after a prolonged period of gales and high tides, there was a storm surge all around the coast of the islands. The effect of this phenomenon was to create a new face to the dune on the south side of the beach. Exposed within this face were stone structures, which were evidently man-made. There were 3 periods of excavation during 1996, each lasting a month. The structures that can now be seen are thought to date from the 7th – 8th century. Due to the exposed position of the site and mobility of the sand, it was impossible to leave the structures as excavated, and they were backfilled with sand. The tops off the original walls of two of the houses can be seen. The houses belong to a distinctive group that is found around the North and West of Scotland in the Late Iron Age or Pictish period, approximately 400- 800 AD. A reconstruction has been built of one of the houses at Bosta. This "jelly baby" house was built using the techniques that were available at that time. The Iron Age House is well worth a visit, where you will be greeted by Elizabeth your guide and local historian, she will have a small fire burning in the centre of the house in the same way as it would have been in the Iron Age times, Elizabeth has reproduced various item from the period which are positioned around the house. Although there are many lobster ponds throughout Lewis and Harris, The Great Bernera Lobster Pond is unique both for its size and length of use. 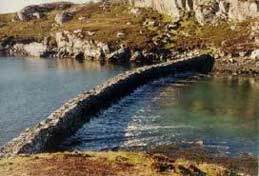 The Great Bernera Lobster Pond was built in the 1860s and is two miles north of the village of Circebost in Great Bernera, on the east side of Loch Risay (O.S.173373). Its Gaelic name is Tob Blar Meadha. The lobster pond was built by Murdo Morrison of 4 Kirkbost. He was born about 1827 and was a fisherman. The construction of the dam with its curved and tapering shape is a feat of engineering, especially for an untrained man. Before the construction of the pond, the fishermen sent their lobsters live to the mainland by various means. The theory of the pond was to store lobsters until conditions and prices were most favourable. There are other, smaller, lobster ponds in the Loch Roag area; one of these is a small one in the south west corner of Loch Risay. The walls of two ponds are still intact on the island of Pabay off Bhaltos in Uig. Little Bernera (Scottish Gaelic: Bearnaraigh Beag) is a small island situated off the west coast of the Isle of Lewis in the Outer Hebrides. Little Bernera lies between the sea lochs of West and East Loch Roag, immediately to the north of Great Bernera. The island rises to a height of 42m (137 feet) and has an area of 138 ha. On the west shore of Loch Riosaigh, Breaclete Mill lies on the outlet of Loch nan Geadraisen half a mile from the road at Breaclete. Breaclete Mill is an extremely good example of a Norse Mill. Today in Lewis there are upwards of some two hundred sites of these small corn mills. They provided communities over the centuries with a source of efficient water power, operated by any small stream. 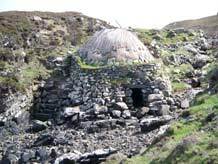 Material for their construction was gathered from the surrounding moor - i.e. stone, peat and clay for the walls. Driftwood was used for the roof and any bog wood found whilst cutting peats. Only three pieces of metal are required for the working mechanism; the drive bar which fits in to the top mill stone, the bar which connects with the drive bar and is morticed in to the timber barrel giving the drive for the mill, and lastly the bearing allows the barrel to spin on its seat. 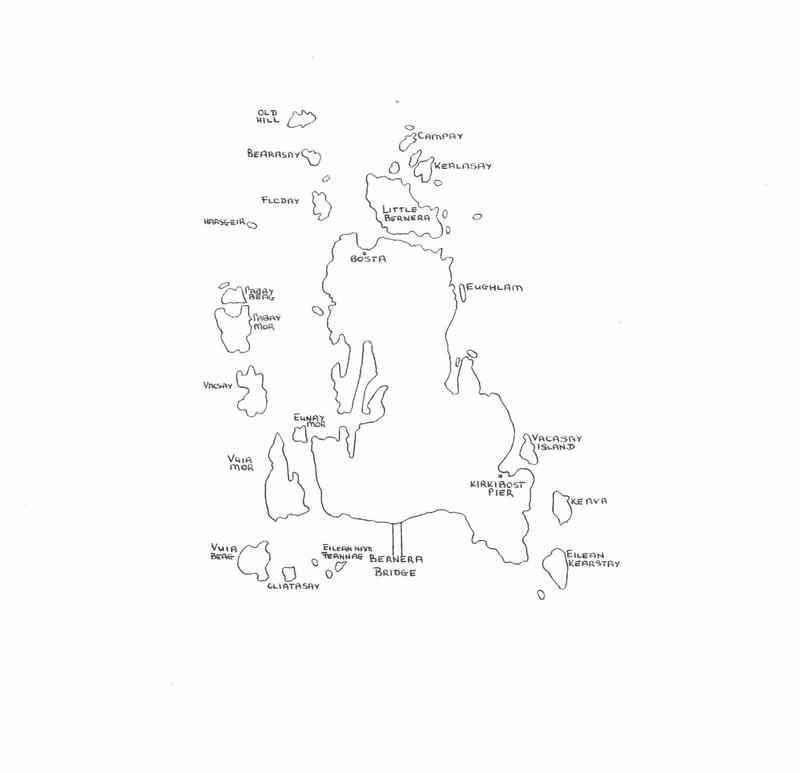 Until 1953, Bernera was an offshore island, linked to the mainland Lewis only by the sea. 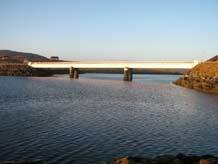 It is without doubt a fact that if the bridge to Bernera had not been built, there would be nobody living in Bernera today. There are many small islands around these shores that once had a thriving population, but are today uninhabited. As the population declined with many of the young people seeking work on the mainland, there were fewer able bodied folk to undertake the arduous work of carrying all goods off and on the island. When you consider that everything not procured on the croft had to be brought in, (peats, paraffin, dry goods, mail, livestock, looms, agricultural machinery) and everything to be marketed had to be taken off, (tweeds, livestock, fish,) it is easily understood that strength of body was required. There were no roads other than cart tracks and on many a day the weather made a crossing impossible. It is difficult, even for those now living in Bernera, to envisage life with these constraints. Today almost every house has access to at least one car, there are mobile shops, library and bank, and a doctor's surgery twice a week. Mail is delivered by post bus instead of by foot or latterly horse and cart. Coal and oil for heating delivered to the door have now largely replaced the hard labour of cutting a years' supply of peat, supermarkets giving choice and a journey of under an hour to the hospital or to work in Stornoway, all encourage people to stay in the island of their birth. At the north end of Pabay Mor there is a large bay known locally as the Blue Lagoon, which is situated just north of the archway through the rock which has been eroded by the sea through time. Inside the Blue Lagoon there are large stone dykes which were used to store Lobsters in times past. Pabay Mor it is reputed was a haven for sea raiders with the Lagoon forming an excellent harbour for boats with shallow draught. Marcus Vergette is a farmer/artist who lives in Devon. Having been imprisoned on his farm for 6 months during the foot and mouth outbreak, he and his neighbours wanted to celebrate their eventual freedom. He devised a celebratory bell, cast in bronze to be sited at the edge of the sea in Appledore near his home (if you would like to hear the bell in Bosta please go to www.marcusvergette.co.uk) The unique feature is that the bell is rung by the high tide. 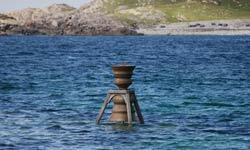 He has expanded the project to 12 sites around the cost of Britain, the 2nd bell was installed in Bosta on June 19th 2010.